For me sleep over the last 6 months or so has been awful. I've felt like I had tried most things until last week my GP put me on sleeping tablets to help me out. It's reccomended to not take them for more than 4 nights in a row as I could get addicted to them. So this is where Feather and Down come in with their great range of products. On the night's I won't be taking the sleeping tablets I'm going to be using some of their products to help me relax and hopefully eventually drift off. 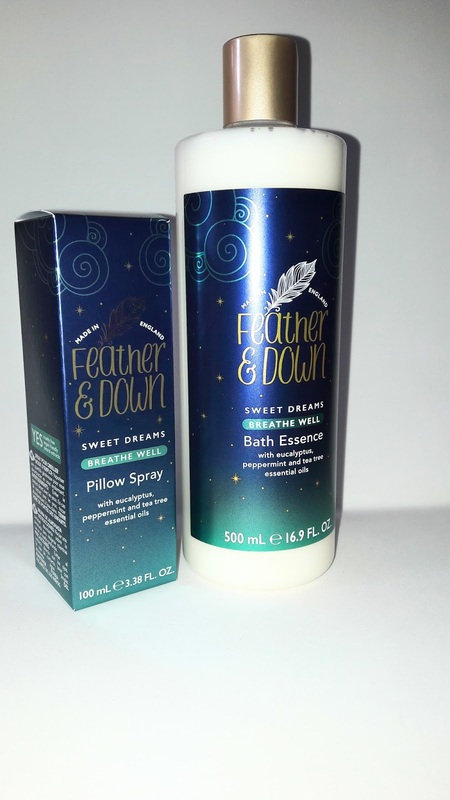 I'm not new to the Feather and Down range as i' ve used a range of products from the sleepy gift set they do and am a huge fan of their products. On the 28th May Feather and Down will be releasing 4 new products to their successful brand and I've been given the chance to try out 2 of the new products and share my thoughts with you. First of all the 2 new products I have been sent are extensions to their bestsellers. The sleep spray and bath essence now come in an all new scent, helping to encourage a restful night's sleep. These products contain the delicate fragrance of Eucalyptus, Peppermint and Tea Tree essentials oils that re renowned for their ‘soothing, cooling and ‘breathe well’ properties.’ All products are also blended with Lavender and Chamomile essential oils to encourage relaxation. The new scent is gorgeous and perfect for helping me to relax and settle before bed. This is definitely going to be my new go to scent before bed and certainly ideal for those nights when I have a cold to help with a blocked nose. One of the other new items to the Feather and Down collection is that they now sell a travel set. This is a welcome addition to their range of products so you can still get a great nights sleep when you are away. The travel set includes the orginal pillow spray a mini melting shower cream, the brand new relaxing roller ball and a mini sleep butter. Last of the new items from Feather and Down is the perfect partners set. The perfect partners set contains the all new relaxing roller ball and a mini sized pillow spray ideal for fitting in your luggage. I'm very excited about the new additions and anything that helps me to get a good nights sleep is a must!